It is a DC 5V Power Supply Module/Driver Module/Adapter, Input voltage: DC 7~28V, Output voltage: 5V.. It is a DC Buck Adjustable Voltage Regulator/Charger/Adapter, Input voltage: DC 4.5~55V, Output volt.. It is a 13W Buck Converter/Power Supply Module/Adapter/Driver Module, Input voltage: DC 4.5~35V, Out.. It is a 300W Buck Power Supply Module/Adapter/Voltage Regulator, Input voltage: DC 48V (wide voltage.. It is a DC Buck Converter,Input voltage range: 4-40VDC,Output 1.25-37VDC,Output current: 2A,Built in.. It is a 240W Buck converter Step-Down Power Supply Module, Input Voltage: DC 48V(wide range 30V~60V.. It is a 1A 5W Power Converter Voltage range AC 90~240V to DC 5 V 1A 5W Buck Converter t has Compac..
1 Meters Mini USB Output Car Power Supply Voltage Regulator. 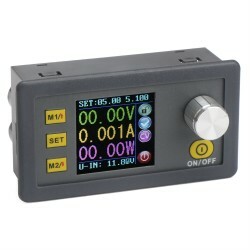 Up to 3A adaptive current output. High .. It is a DC Drive Power Supplies Voltage range AC 90~240 V 110V to DC 5V 700mA 3.5W Buck Regulated Co.. It is a 200W Buck Power Supply Module/PWM Speed Controller/Driver Module/Adapter, Input voltage: DC .. It is a It has Shortage Protection,Temperature protection,Overcurrent protection Buck Converter ,Vol.. It is a Power Supply Module/Adapter, Input Voltage: DC 6 ~ 15V, Output Voltage Group: 3.3V, 15V, 20V.. It is a 15W Voltage Regulator/Power Adapter/Power Supply Module, Input voltage: DC 8~22V, Output vol.. It is a DC 8-22V to 5V/3A step down converter, Input voltage DC 12V (8-20V),Output voltage DC 5V，max..